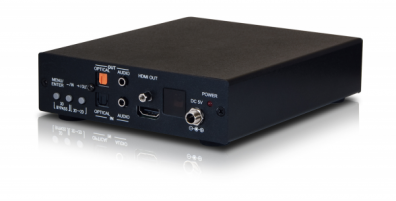 The EL-5400 is a HDMI, VGA, and Display Port presentation switcher with added 3D to 2D conversion capabilities. This device can scale and switch HDMI, DisplayPort, PC and Component inputs to its HDMI output, with their associated audio signals to the native resolutions supported by the connected display. Control is via the IR remote, or RS-232 protocol.